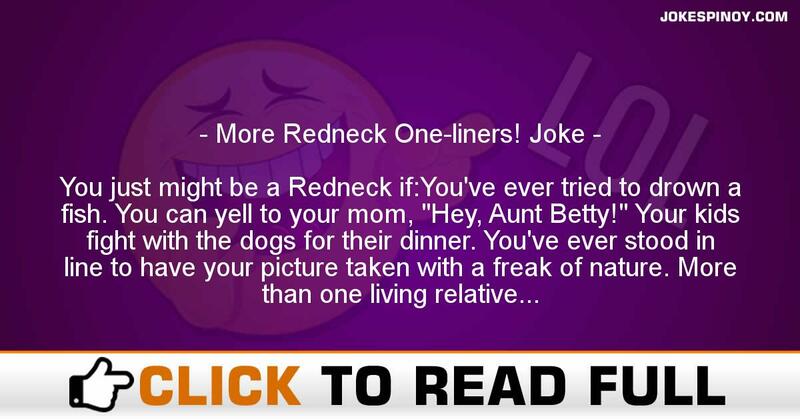 You just might be a Redneck if:You’ve ever tried to drown a fish. You can yell to your mom, “Hey, Aunt Betty!” Your kids fight with the dogs for their dinner. You’ve ever stood in line to have your picture taken with a freak of nature. More than one living relative is named after a Southern Civil War general. Your boat has not left the driveway in 15 years. Your mother has been involved in a fist-fight at a high school sports event. None of your shirts cover your stomach. You consider a six-pack and a bug-zapper high-quality entertainment. You’ve ever been kicked out of the zoo for heckling the monkeys. You’ve ever bathed with flea and tick soap. Your family tree does not fork. Your baby’s first words are “Attention K-Mart shoppers.” You have a Hefty Bag for a passenger-side window. The fifth grade is referred to as ” your senior year.” Three quarters of the clothes you own have logos on them. Your gene pool doesn’t have a “deep end.” You have the taxidermist’s number on speed-dial. Your dog and your wallet are both on a chain. The UFO hotline limits you to one call per day. Your two-year-old has more teeth than you do. You have ever been accused of lying through your tooth. Your underwear doubles as your bathing suit. You let you kid pee in the parking lot at K-Mart. ABOUT US : Laughter is the greatest medication as the old saying says, we at JokesPinoy.com will supply you with all the humorous filipino quotes and pictures in tagalog language. Back in 2013, a group of Filipino OFW (Overseas Filipino Worker) got bored and they make an effort to look for some funny quotes on the internet just to have fun but unfortunately most of the websites they found on that time are having an old jokes and have no interaction with the users. From that instant, they then got an idea to build their very own jokes website and let other users to give their jokes or comment together with the present jokes. After the funds and concepts collected, JokesPinoy.com was born, a website that let the user share their jokes and let them have dialogue with other users as well. Since the website has been launch, tens of thousands of visitors are coming each day to read jokes and have fun on the website and also as giving their view on the jokes they read. We hope from JokesPinoy.com that this website may provide you some smile and happiness, Life is Short so have fun on it. DISCLAIMER: A number of the jokes, photos and videos found in this site aren't created by us, they are created by our users or they simply get it somewhere in the net just like 9gag, youtube, metacafe, vimio and etc. We respect copyright information that is posted here including funny pictures and funny videos. If encase there are files posted here in our site that is possessed by your and you don't need to share it to anybody subsequently fell free to contact us to remove it. Majority of the language used on this particular site was in tagalog and some are bisaya that are both filipino language which originated from Philippines, in case you would like to translate the joke to english you can used an online translator to interpret it from tagalog to english.